that I posted last week. You are becomming a real pro. This is adorable. Tag card how cool like the concept. 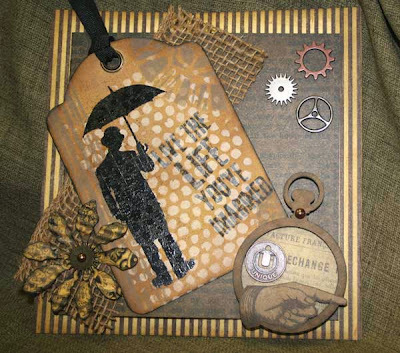 Fabulous masculine card with so many wonderful and interesting items used. Super job! WOW Terri ... I see you've really grasp all those wonderful techniques that Joan has taught you. You are learning from one of the BEST!! GREAT job!! Way to go Terri, you keep going at this rate and you'll be doing the weekly challenges. I'm all into men cards, since I live with so many. This really cute. Love~love your "guy" card Terri. Lots of wonderful elements here, I bet he loved it...nothing better then a homemade card from Mom!! And I can also see you are getting quite a bit of "supplies" in your stash...welcome to our "addiction"...LOL! !